Students in public schools are receiving a miseducation in tolerance thanks to a new mandate from the State Department. President Barak Obama decreed schools need to grant unfettered access to school facilities for students who choose their gender. The act speaks against discrimination, calling for greater tolerance in how students self-identifying as transgender participate in school. The move is seen as a lesson in tolerance. This tolerance holds stiff intolerance for opposing views. It cites the civil rights era and references Title IX for legal authority. A backlash from critics with a traditional view of sexuality is being cast as intolerant. What the mandate needs is an education in tolerance. Webster's dictionary defines tolerate as recognizing and respecting other's beliefs and practices, "without sharing them." It goes on to paint a picture of bearing with, or putting up with, someone or something that isn't especially liked. A friend of mine once described tolerance as allowing a faucet to drip. The sound isn't especially pleasant, but a person allowing the faucet to continue dripping is tolerant of it. To force the faucet to stop dripping is intolerant. Sometimes, intolerance is a good thing. The impression from Air Force 1 is that opposing a student's right to practice self-defined sexuality is intolerant. However, the debate isn't so much around a person's right to define themselves as much as it is about a person's right to oppose an idea. This mandate may legally bind all public schools to allow students to practice self-identified sexuality. It will reshape restrooms, locker rooms, and because the decree sites Title IX, gender segregated teams are likely a thing of the past if the decree stands. The mandate calls for a moratorium on requiring medical documents of transgender treatment for athletes switching their birth gender. Meaning a boy could self-identify as a girl and break scoring records for their high school team, and it is essentially legally binding. Opposing a student's right to self-identify their gender, and practice school related functions, is essentially going to be a prosecutable offense. This forced tolerance is really no tolerance, especially for those who trade tolerance for apologia. Apologia is the Greek work for a reasoned defense. Many Bible-believing Christians hold to a God-defined view of sexuality, notably one that emerges in the first few chapters of the Bible where God creates male and female at different times and in unique and valued positions. For many Christians, their view of gender transcends the rosary and small catechism. It is more than a doctrine. It is a fundamental reality like gravity or Newtons 2nd Law of Thermodynamics. But the world's perspective of Christians opposing self-identifying gender is often called intolerant, thought to be unloving. Christians see transgenderism as a self-destructive practice, one that not only destroys God's design, but often sees disease, depression, and suicide trail the decision to redefine sexuality. Therefore, Christian opposition is much like pushing a friend out of the way of a runaway car. A correct Biblical view of opposition is wholly loving when it is based in Christ. 1 Corinthians 13:7 calls believers to possess a love that, "endures through every circumstance." In the gender debate, Christians aren't to call down brimstone. They are to possess a love that endures every circumstance. This doesn't mean tolerance is approval, but a willingness to enter the fray and endure the hardship of disagreement. A Biblical view of tolerance allows for disagreement, with love holding the relationship together instead of consensus building community. Romans is another place Christians understand tolerance. Most secular critics stop at the second chapter and call the book of Romans homophobic. But reading on is enlightening, especially chapter 12:16, 18, that calls believers to, "Live in harmony with each other...Do(ing) all that you can to live in peace with everyone." Christians often have the best perspective of tolerance. We see it in Jesus every time we approach the throne. There is mercy, not because Christians are righteous, but because Jesus holds mercy for sinners. The grace of Christ is the basis of Christian love. 1 John 4:7-8 calls believers to love, because followers of Jesus see that love comes from God and everyone who knows God knows love. Therefore, followers of Jesus have a grace-filled understanding of love and tolerance because believers have an example to follow in Jesus Christ. Honest believers see that perfection in thought and practice is not a prerequisite for love from God. While the culture mandates love as tolerance, Christians see Jesus building relationship with broken sinners without approving of their destructive behavior. The way Jesus interacts with people in the four Gospels is the epitome of tolerance. The Christian perspective holds more freedom and more love, no matter how genuine the culture appears. Scripture is fairly clear believers are to treat people holding opposing views with a humble and meek love. Ephesians 4:2 calls Christians to be humble and gentle, holding a special patience that makes allowance for faults because of a Christ-centered love. Christians are not weak. Instead, holding strength in conviction and reason, they love with a Christ-like patience and mercy. There is more strength in patience than moral decree. Reading on, Ephesians is chock-full of other examples of how Christians tolerate opposition. Ephesians 4:32 calls for kindness, with a tenderhearted position that loves others as God, through Christ, has loved and forgiven the believer. The example of tolerance is Christ, who does not condone sin, but rests with the Samaritan at the well and breaks bread with tax collectors in a patient and loving friendship. His relationship is a preserving salt that sustains and calls out humanity in the face of dehumanizing actions. Therefore, a Christian view of tolerance is very compatible with a logical, dictionary defined resolution of what tolerance is. Tolerance is not condoning. Tolerance is a patience that expresses love in the face of disagreement. The New Tolerance says there is no room for disagreement, because everyone's truth is equally true. When R. Kelly dropped his bomb of belief, singing of a conviction that he could fly, it may have challenged logic, but the New Tolerance says we shouldn't cast knowledge on belief because all beliefs are created equal. So, it is intolerant to grant someone the right to believe what they want without agreeing that the person is right in their belief. Culture says stop being so smart. Individuals have the right to hold views in the New Tolerance that demand equal footing, receiving validity and support, without criticism. All beliefs are equal. All lifestyles are equal. All claims of truth are equal. Josh McDowell notes in a recent book that, "It's not enough for the church to express love and respect toward those who believe and live contrary to Biblical morality. To be truly tolerant, they and all Christians must agree that another person's opposing position or behavior is right for him, and in fact, praise him for it." The world cannot operate in a New Tolerant way. Without opposition and correction the world could stand in unison atop the Empire State Building with R. Kelly blasting from Times Square and sing to their damnation as they practice their belief. Simply mandating culture to accept and praise someone's self-identification, that goes against biology, psychology, physiology, and a host of other academic disciplines, is an act of ignorance. True understanding, driven by logic and reason, shows the inconsistency and incoherence of the transgender movement. Romans 2 warns that a world rejecting God and God's laws will be given over to a depraved mind. Schools are storehouses of research into a world that is coherent, operating with certain consistent principles that reveal a complete universe. Students in Obama's America are being forced to set aside text books shouting to the order God placed in motion in exchange for a depraved thinking in transgender accommodation. The accommodation is shrouded in the New Tolerance. Opposition to the New Tolerance is not wrong or bad. The world is bending the hearts of Christians to love world-defined pleasure and peace over a God-defined order and understanding. McDowell says it best when he says, "We are not called to be tolerant of others as the culture defines it; we are called to be loving as the Bible defines it." Teaching students to to rest in the order, logic, and reason God established in sexuality requires an intolerance in the thinking of the world. It calls for a patient love for those held captive by the culture. Essentially, intolerance is a beautiful thing. It can provide a conduit for God to rehumanize broken humans. It can correct faulty thinking. Just ask those who triumphed over Nazi Germany, 19th Century pro-slavery England, and marched with Martin Luther King Jr.. They all held an intolerance of a redefinition of humanity that the world was casting. God bless our president, and our country, and may we educate young people to do the same by lovingly opposing bad ideas through dialogue and critique rather than political fiat. 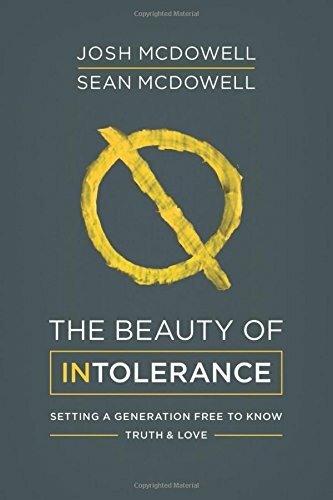 Much of the references and foundational thoughts for this article come from Josh and Sean McDowell's new book, "The Beauty of Intolerance." It is a recommended read for all parents, especially parents of Hillcrest Academy.